We are continuing to accept registrations for the current remaining year for classes that have spaces available. Registration forms must be completed online and submitted along with a $50 non-refundable registration fee. The registration fee can be paid online using Paypal or a credit card. At Springhill we offer flexible and part-time enrolment. You can choose the number of eligible days your child will attend. During the school year, registrations are taken on a first-come, first-served basis and filled until classes are full and then placed on a wait list. Please contact our Registrar if you have any questions regarding availability. • Children must be two by December 31, 2018. • Children do not have to be toilet trained. • Children must be three by December 31, 2018. • Children must be daytime toilet trained. “Daytime toilet trained” means the child may wear diapers/pull-ups for naps or at night, but is toilet trained the rest of the time. • Children must be three on or before September 1, 2018. • Children must be daytime toilet trained. • This class is science focused. The children participate in a variety of experiments and investigations. • Children must be four by March 1, 2019. Once a child begins a program, they stay in that program for the entire school year even if/when they have a birthday during the year. For example, if a child starts in the two-year-old program in September and turns three in February, the child remains in the two-year-old program until the end of the school year. In lieu of fundraising, the parents of Springhill Community Preschool have decided on a fundraising fee. The fee per child is $300 per year divided into two payments (October and February). 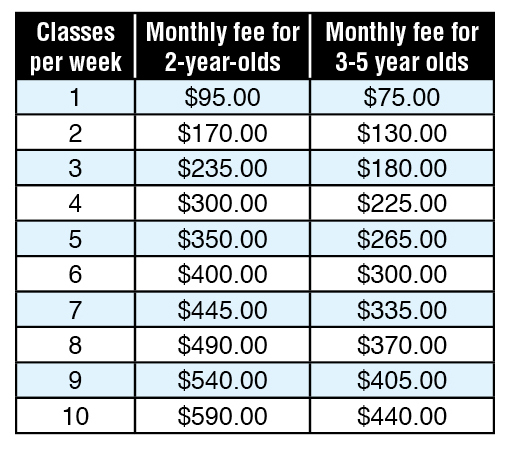 Fundraising fees will be prorated if a child starts part way through the year and are not refunded once cashed (ie after October 1 or February 1). Attend three General Meetings (usually September, January and June). Fulfill a volunteer position (all volunteer roles are listed and summarized in the parent handbook). Participate in two cleaning bees per year. Subsidies are available through the Alberta Government for families who need financial assistance. Please visit the Alberta Children and Youth Services website for more information. If you wish to withdraw your child, you must notify the registrar in writing at least one month in advance. PLEASE NOTE: If you wish to drop a class/classes before classes begin in September, this request must be received before June 1, 2018. Changes made after this date will result in a $50 change fee. For changes made to enrolment after September 1, 2019, notice of withdrawal must be received on or before the first of the month to be effective on the last day of that month. For example, notice must be given on or before March 1 to with draw a child as of March 31. If notice is given on March 2, the child would be considered withdrawn as of April 30. A student may continue to attend classes during the notice period. The board has decided to offer free registration (maximum $50 value) for any family that refers another family to Springhill for the upcoming school year. Once the new family has registered, the referring family will either be refunded their registration fee for 2018/19 or have the fee waived once they register. Please encourage your friends and family to consider Springhill Community Preschool for their children! (2s) Monday mornings - 9:15 to 11:30 a.m.
(2s) Wednesday mornings - 9:15 to 11:30 a.m.
(2s) Friday mornings - 9:15 to 11:30 a.m.
(3s) Tuesday mornings: 9:15 to 11:45 a.m.
(3s) Thursday mornings: 9:15 to 11:45 a.m.
(3/4s) Monday afternoons: 1:00 to 4:00 p.m.
(3/4s) Wednesday afternoons: 1:00 to 4:00p.m. (4s) Tuesday afternoons: 1:00 to 4:00 p.m.
(4s) Friday afternoons: 1:00 to 4:00 p.m.
Has sibling(s) previously attended Springhill? Please use an individual NOT listed as a parent or guardian. Is there any person to whom your child MUST NOT be released? Please email a photo of this person along with detailed information of the situation to registrar@springhillpreschool.com. Please note that your registration will not be considered complete until we receive this information. In case of emergency, I grant permission to the teaching staff to take whatever steps may be deemed necessary to administer emergency first aid and/or obtain medical care for my child. I agree to cover the cost of an ambulance if one is deemed to be required. I grant permission for my child, to leave the Springhill Community Preschool classrooms under the supervision of the teaching staff and within the Queen Alexandra School grounds and facilities. I grant permission for the teaching staff to take photos of my child, and post those photos in the classrooms of Springhill Community Preschool. The information you provide on this Registration Form will be made available to the teaching staff and Springhill Board of Directors. We also publish, from time to time, a class list for each program, including your child’s name and home number as well as your first name(s) and email address. Parents find the class list helps them learn each other’s names and enables them to get together socially. Yes, please publish my family's information on the class list. No, please do NOT publish my family's information on the class list. If my child is awarded a spot at Springhill Community Preschool, I agree to pay the tuition and fundraising fees, participate in the Casino fundraiser, abide by Springhill Community Preschool’s policies, attend three Parent Meetings, fulfil a volunteer position and participate in two Cleaning Days. Thank you for sharing this exciting time in your child’s life with us. It will prove to be a year full of friendship and discovery! We look forward to seeing you in our classrooms! Please note that your registration is not considered complete until you have submitted your $50 registration fee payment. Please proceed to Paypal by clicking the pay button. Once your payment has been processed, your child's registration is considered complete.